Mad Science of Delaware Valley: SLIME Birthday Party! My children are slime OBSESSED! I’m guessing the majority of those reading this are bowing their heads in solitude, because yours too are obsessed. I have cleaned slime off of clothing, floors, in multiple sinks around my home, the garage floor, my Tupperware containers, and more. So when my 8 year old asked for a slime themed birthday party, I was out. I couldn’t deny her of this wish fast enough! NO to the DOUBLE-NO was I having a house full of 3rd graders making and playing with slime!!!!! And then I stumbled upon Mad Scientists of Delaware Valley and read about their business. For 17 years, they have been providing STEM programming in our area: After-School Science Club, Assemblies, Summer and Vacation Camps, Birthday Parties, Scouts Boys/Girls programs, Library Programs, Fundraising and School Events, Corporate Special Events for Families, FUN science Booths, Holiday/Party Spectacular Shows, Community Special Events Shows and FUN Science Stations. So I reached out to them to see if they would do a slime birthday party. And sure enough, folks, THEY DO! They bring it all, and better yet, CLEAN it all. HA! 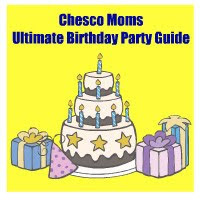 We were able to book our party for the time and date of our choosing and it included up to 24 children! Which was excellent, we then made it a family BBQ party and welcomed siblings as well. The party included some magic/science experiments that the children found super cool. They wore protective disposable glasses much like the 3D kind in movies. Our party host was Atomic Amy and she had one trunk with all of the goods in it. All we needed was a sink and a table for her! I’ve never seen 21 children sit and watch someone for a full 45-minutes like they did her! They loved the show. It wasn’t over-the-top educational, but had a learning flare to it, which as parents we appreciated. This was such a unique birthday theme and concept. I was really happy when they agreed to let me give them a blog “shout out”. Disclaimer: In exchange for my honest review, Mad Scientists of Delaware Valley gave me a 50% discount on our party.